Summary and Definition: The rise of prosperity of the United States in 1920 led to the emergence of American Consumerism in the period in history known as the Roaring Twenties. Consumerism is the theory that it is economically attractive to encourage the attainment of goods and services in ever-increasing amounts. American Consumerism increased during the Roaring Twenties due to technical advances and innovative ideas and inventions in the areas of communication, transportation and manufacturing. Americans moved from the traditional avoidance of debt to the concept by buying goods on credit installments. Mass advertising and marketing techniques via the 1920's newspapers and the radio saw a massive increase in sales via easy consumer credit. 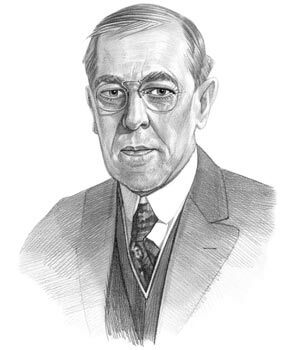 Woodrow Wilson was the 28th American President who served in office from March 4, 1913 to March 4, 1921. One of the important events during his presidency was the rise of American Consumerism in the 1920s. Fast, fun facts and Frequently Asked Questions (FAQ's) about the American Consumerism 1920s. What is an example of Consumerism 1920s America? The following fact sheet contains interesting facts and information on American Consumerism 1920s for kids. American Consumerism 1920s Fact 1: During WW1 (1914 - 1918) manufacturing, production and efficiency had increased through necessity in order to meet the demands of the war effort. American Consumerism 1920s Fact 2: The new advances in manufacturing techniques, the factory system and the efficiencies of the assembly line were transferred from meeting military needs to the consumer goods industry and making commercial products. American Consumerism 1920s Fact 3: Technology had advanced and the nation had entered the age of steel and electricity. Industries switched from coal power to electricity and most homes, especially in the towns and cities, were lit and powered by electricity. American Consumerism 1920s Fact 4: The 1920's introduced Consumerism and Materialism to the United States with massive changes to lifestyle and culture. The Roaring Twenties or the Jazz Age, became associated with modernism, consumerism, sophistication and decadence. American Consumerism 1920s Fact 5: After an initial recession in 1919, middle class Americans moved to a period of prosperity. Between the years from 1921 to 1924 the nation’s gross national product jumped from $69 billion to $93 billion and wages rose by 22% from roughly $36.4 billion to $51.5 billion. American Consumerism 1920s Fact 6: Access to electricity provided Americans with the power required to run new labor saving appliances and luxury products such as radios, phonographs, electric irons, refrigerators, washing machines, electric razors, vacuum cleaners and gramophones. American Consumerism 1920s Fact 7: In the 1920'S America was beginning to prosper and new technology, mass production and labor saving devices gave Americans more time for leisure. They were able to enjoy a wonderful taste of freedom due to the introduction of mass-produced, cheap automobiles that revolutionized transportation in America. American Consumerism 1920s Fact 9: Mass Production techniques, such as the introduction of the Assembly Line in factories, enabled massive quantities of products to be produced quickly and efficiently by an automated, mechanical process and reduced consumer costs. American Consumerism 1920s Fact 10: The lifestyles of Americans were significantly effected by the availability of labor saving products, luxury items and the emergence of mass advertising campaigns and consumerism. American Consumerism 1920s Fact 11: The consumer goods industry was not just restricted to the sale of automobiles and labor saving appliances and devices. Personal grooming items such as cosmetics, hair dye, mouthwash, deodorants, tissues, and perfumes were added to the ever-growing list of consumer products. American Consumerism 1920s Fact 13: The movie industry exploded in the 1920's. By 1929 an average of 100 million Americans went to the cinema on a weekly basis. Stylish movie posters, some hand painted reflecting the modern Art Deco style, advertised the newest movies to hit the silver screen. American Consumerism 1920s Fact 14: Audiences of this vast size ignited the imagination of merchants and manufacturers with products to sell. The movies were one of the most important advertising mediums of the 1920's. The following fact sheet continues with facts about American Consumerism 1920s for kids. American Consumerism 1920s Fact 15: Magazines and newspapers picked up on the culture of consumerism and advertisers reached millions of people through advertising via this media. American Consumerism 1920s Fact 17: Advertising changed the way that people prepared their meals with the new types of cookers. Glass cookware and frozen foods were also introduced in the 1920's. American Consumerism 1920s Fact 18: Americans also changed the way they cleaned their homes with the introduction of vacuum cleaners and a vast array of domestic cleaning products. Advertisers used the fear of disease to sell their cleaning products and Americans purchased them to protect their families from horrible illnesses - they were reminded of the lethal 1918 Spanish Flu Pandemic that had swept across the world. American Consumerism 1920s Fact 19: Mass advertising promoted new products in the consumer society of America. Advertisers preyed on the fears and anxieties of Americans or promoted the qualities of the era such as leisure, convenience, fashion and style. American Consumerism 1920s Fact 20: Radio, the first mass broadcasting medium, were also introduced in the 1920's was that drew the nation together by breaking down provincialism. The radio programs spread modern ideas and advertisements to millions of listeners. By the end of the 1920s there were over 100 million radios in use in America. networks sold more than $1 million in advertising time to the Democratic and Republican Parties. For more facts refer to 1920's Radio and Advertising. American Consumerism 1920s Fact 22: Much of the new Consumer Society was built on easy consumer credit. Americans who were once "thrifty and prudent" they bought most of their more expensive goods on the installment plan, paying some money down at first, followed by 1 -5 years of monthly payments. American Consumerism 1920s Fact 23: The great financial innovation of the 1920s, was the tremendous growth of Installment Plans, meaning buying on credit. Mass advertising reflected the general acceptance of buying by installment as a way to finance consumption. American Consumerism 1920s Fact 25: 75% of the U.S. population spent most of their yearly incomes to purchase consumer goods including food, clothes, radios, and cars. American Consumerism 1920s Fact 26: Ordinary Americans were building up high debts because of easy credit and started to gamble on the Stock Market, believing it was a 'safe bet'. American Consumerism 1920s Fact 27: The excess of the 1920's and the Consumer Society ended abruptly with the 1929 Wall Street Crash. Share prices began to fall and $30 billion was lost in just two days. American Consumerism 1920s Fact 28: The Total Consumer Goods purchased on Credit in 1929 was $7 Billion. Consumer Credit outstanding in 1929 totaled over $3 Billion. American Consumerism 1920s Fact 29: The Stock Market crash led to the ruin of many Americans and was followed by the Great Depression. The Great Depression witnessed the end of the Consumer Society and consumerism in the 1920's. The article on the American Consumerism in the 1920s provides detailed facts and a summary of one of the important events during his presidential term in office. The following Woodrow Wilson video will give you additional important facts and dates about the political events experienced by the 28th American President whose presidency spanned from March 4, 1913 to March 4, 1921.